LUCENA CITY – Although Quezon has been recognized as the province with the most number of established public library in the whole country in 2000, 4 of its municipalities have no public library at present. “Tayo, ang Quezon province, ang ni-recognized sa buong bansa na may pinakamaraming existing public library noong 2000 at ang Alabat ay may reading center ang lahat nitong 19 barangays,” Quezon Provincial Librarian Ismaelinda Cabana told Sentinel Times in an exclusive interview on Friday (Nov. 9) at her office here. Cabana however also disclosed that 4 towns have still no public library affiliated with the National Library, namely, Burdeos, Infanta, Patnanungan and Real. The National Library supervises all public libraries in the whole country. She said that Burdeos has a library building but it does not function as a public library, while Gen. Luna has a library being run by a nongovernment organization. Cabana admitted that in most of the local government units, a public library is the least priority. She recalled that during the administration of former Gov. Wilfrido Enverga, it issued a policy of adopting a municipality for the establishment of a public library. 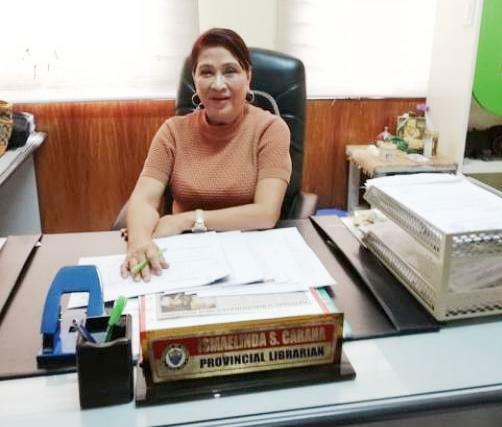 “Gusto ko affiliated ang ating mga municipal public libraries sa ating National Library para sa online services nito gaya ng LiveTech, ProQuest at sa DOST Starbook, Techno-Aklatan ng Dep-Ed, at iba pa,” said Cabana who expressed pride that Quezon provincial library has 5 licensed public librarians with masteral degrees. She said that they are giving away their sets of encyclopedias to municipal libraries as the trend now in provincial libraries is online services of informative books and reading matters because of the advent of the internet and information technology. In 2012 Quezon Provincial Library and Gintong Yaman Museum was adjudged Outstanding Provincial Library of the Phils. and was among the top 5 in the 2013 Search for Outstanding Children’s Services in the National Library of the Phil. Affiliated public libraries. Last Sunday, the Quezon Provincial Library in partnership with the Librarians Association of Quezon Province-Lucena Inc. (LAQUEP-LINC) has conducted their 5th Zumbook. A Zumba Dance Book Drive at SM City Lucena Parking Area. The activity is designed to help build libraries in public schools, municipalities and communities in Quezon Province.